Following the release of Jewish Voice for Peace’s book “On Antisemitism: Solidarity and the Struggle for Justice,” JVP Executive Director Rebecca Vilkomerson will be speaking on a panel moderated by Democracy Now!’s Amy Goodman, about the challenges and importance of confronting antisemitism as a progressive Jewish activist in the Trump era. 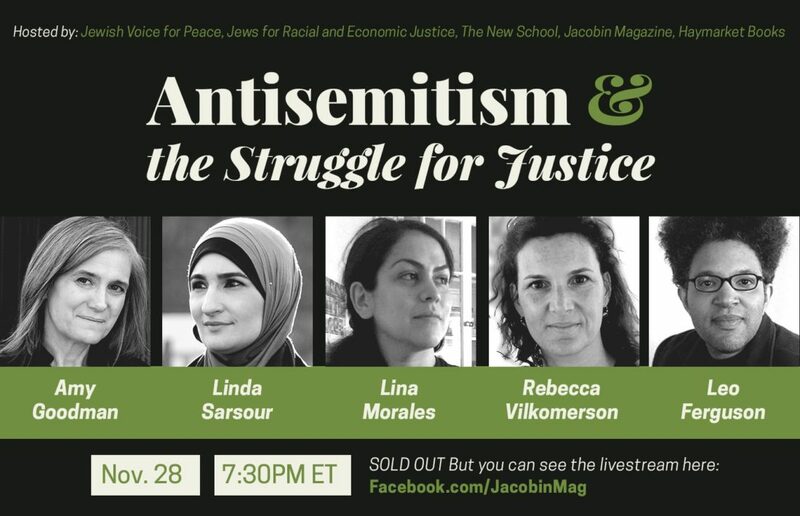 The event is jointly sponsored with The New School, Jacobin Magazine, Jews for Racial & Economic Justice (JFREJ), and Haymarket Books, which published On Antisemitism. A year into the Donald Trump presidency, the growing power of antisemitic, racist white nationalists on the one hand, and the systematic efforts within the American Jewish establishment to silence or defame those who are critical of Israel and advocate for Palestinian rights as antisemitic on the other, make it an urgent time to discuss antisemitism within the context of the growing progressive movement for social justice. The event is sold out and will be livestreamed at facebook.com/JacobinMag. Limited number of press passes are available. Please contact media@jvp.org to request a press pass. Leo Ferguson is the community and communications organizer for Jews for Racial & Economic Justice. Lina Morales is a member of the Jews of Color and Mizrahi/Sephardi Caucus in partnership with Jewish Voice for Peace. Linda Sarsour is the former Executive Director of the Arab-American Association of New York, a co-chair of the National Women’s March, and was a co-founder of MPower Change. Rebecca Vilkomerson is the Executive Director of Jewish Voice for Peace.